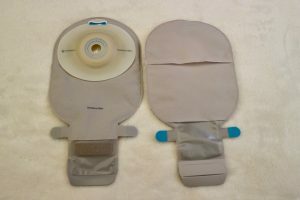 Ostomy Bags are often referred to as ostomy pouches or ostomy appliances. They come in three different types and with numerous options. 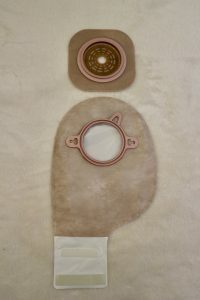 The three types of ostomy bags are colostomy bags, ileostomy bags and urostomy bags. 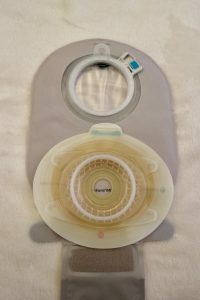 Within these types of ostomy bags there are many variations. Below is the comparison of a one versus two piece system. Pouch: the bag which collects waste – urine or feces. Baseplate: the adhesive backing of the bag which sits directly on the skin. When it comes to a two piece bag, these obviously come in two pieces. The baseplate can also be called a barrier or wafer; depending on who you talk to and where they come from. Drainable: means the end of the pouch has an opening in which output can be drained from. These usually applied to ileostomy bags, because their output will be thinner and more frequent. Drainable also applies to urostomy pouches but they have a tap or bung on the end; which make it’s easier to empty the urine. Closed: means that the pouch has no opening at the end. This means that the bag is changed when full, either in its entirety – baseplate and pouch – or just the pouch; if it’s a two piece system. 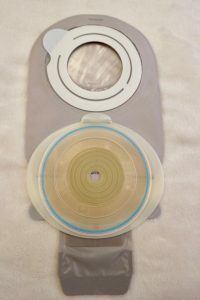 Flange on skin barrier: this is a common term for the baseplate for a two piece system because you can see the flange – supporting ring / area – which helps the baseplate connect to the pouch for security. NB: The samples I was sent were for drainable pouches, as I have an ileostomy. What is a One Piece System? A one piece system is a bag which has the pouch and baseplate fused together in the manufacturing process. 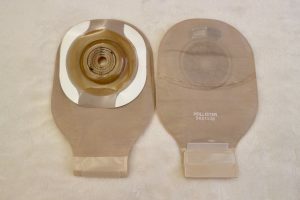 All three types of stoma can use a one piece system. These bags are commonly used for ileostomies. This is due to the nature of their stoma; it products more output of a porridge like consistence and can hold up to being on the skin for days at a time. It is a cost efficient way to wear and use a pouch, if you have a consistent output. This applies very similarly to urostomates too. That being said, colostomates also like one piece bags. Changing the whole system once full works well for colostomy patients as this is predictable and can happen at a set time during the day. However, taking a bag off your abdomen every day – or sometimes, multiple times a day – can impact on the peristomal skin. Above: The Coloplast Sensura Mio one piece system and the Hollister Moderma Flex one piece system. What is a Two Piece System? A two piece system is where the pouch and flange remain separate and are put together during a change. When it comes to a two piece system, there are two main ways there are connected together – either with a mechanism which locks or clicks the two pieces together, or with a strong adhesive. On the baseplate here, the flange is visible. Flange here means the area in which the pouch and baseplate couple together. Beyond the flange, the baseplates an adhesive border to help the baseplate adhere to the skin with enough size to ensure security and comfort. Above LEFT: The Coloplast Sensura Mio Click and Flex two piece system. Click has a mechanical coupling whereas the Flex has an adhesive coupling. Above RIGHT: The Hollister Moderma Flex two piece system. It has a lock mechanical coupling, as like all Hollister bags, has a plaster-like adhesive border. On all three, you can see the visible flange area, where the cutting range sits and where the stoma sit inside of the ring to help stabilise the baseplate when it attaches to a pouch. One bag, one item to use. Thus, less to carry with you if you travel. Some feel this is more comfortable. Takes less time to change! Can sometimes be difficult to get a perfect fit. Hard to burp your bag if you have excess air / gas. If the baseplate leaks, you have to change the whole bag. Like wise, if you have a problem with the pouch, the whole bag has to be changed. Can be more difficult to apply. No option to change to a different style or size of pouch for different activities. Changing closed, one-piece pouches often can lead to skin irritation. Whilst this type of system is perfect in its simplicity, it lacks flexibility and this why some choose to move from one piece to two piece once they return to being more active, more confident and more sure of their change routine. Allows for a perfect fit – you can see the cutting when you apply the baseplate on, solo. Allows for rotation of the pouch – if this is your thing. Allows you to change the pouch, not the baseplate. Allows you to have an ileoscopy – an endoscopy through the stoma – without removing a whole bag. Can change to different size pouches, depending on activity. If you irrigate, you can just remove the pouch to do this and replace when done! Mechanical coupling add bulk to your bag and can feel very hard compared to a one piece. They are more expensive, as you are using both a baseplate and pouch. The pouches can still detach from the coupling and cause leaks. The mechanical coupling is not ideal for hernias. Adhesive coupling can also leak if not connected together correctly – either on first application or when changing the pouch. This style of system adds in flexibility but also adds in human error; especially for those with vision or dexterity issues. And whilst the adhesive two piece system is a hybrid of the two different systems working together – it gives a low profile with the added comfort of a one piece – it also increases the probability of a leak. And whilst the manufacturers assure users that you can remove the pouch and reapply or adjust it, if an error with placement occurs, it’s not a risk that some ostomates are willing to take. This is not to say that you can’t use a different system for your stoma. Ileostomates favour two piece systems as much as colostomates and urostomates. It’s all down to personal choice and preference. What is important is the flexibility now being offered across ranges within company product lines. Examples of companies which do both one piece and two piece systems well are Coloplast with their Sensura Mio range, Hollister with their Moderma range and ConvaTec with their Natura range. However, different manufacturers do different things: Salt’s only do two piece in closed and drainable pouches, not for urostomies. And Dansac and Pelican only do one piece bags. Two piece system are usually something that are experimented with after surgery and the stoma has settled down. It can take some dexterity and strength to get the two pieces of the system together. Sometimes, you can get more wear out of a two piece system. If the baseplate is cut and applied perfectly, you can get days wear out of it. This is favourable to colostomates who have predictable output. However, the baseplates and pouches come in different unit sizes. Which can sometimes make ordering abit of a faff. Again, something that you get more used to as you live with your stoma. Being able to experience with two piece system if you have always used a one piece is a good learning curve. It can be used well if you are travelling, if you go walking alot without a bathroom break, if you swim or enjoy showering without your bag. Sometimes a two piece bag might be more visible under clothing, as the coupling has to be hard to ensure the integrity of the bag. Also, this hardness can sometimes cause pressure on the peristomal skin, especially close to your stoma. If you are unsure about a two piece bag, please either contact your SCN in the first instance, and always try it before hand – the manufacturers usually have a dedicated team for stoma bag samples, so it is worth speaking to them directly to ensure you have the best product for your stoma. It is always important to make sure you know how the coupling system works on your two piece – I would recommend trying the click / lock or adhesive before applying it to yourself. Some people tend to apply the baseplate – to ensure fit and placement – then apply the pouch. Others just apply the whole two piece system like they would a one piece. This is a personal preference and dependent on circumstance – ie I would apply a two piece in its entirety if I was changing and my stoma was abit more active that I would ideally like during a change! If a two piece system doesn’t suit you, don’t take this a failing. Take that as reassurance that they bag you currently use is working well and you have one less thing to worry about! Last but not least; if you find a two piece hurts you or your are unsure about either of the systems, please speak to your SCN. Trying something new is sometimes scary and unnerving. And sometimes it’s not necessary. 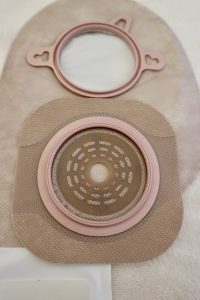 My stoma bag was a one piece flat, Sensura Mio from the second day post op. About a week later, we changed it to a Convex Sensura Mio, due to my constant leaks. I still use the same convex bag almost two years later. But, I have experimented with different systems and different brands. It was about 4 months after my op that I got some samples of a two piece bag to try. This was the Coloplast Click version of my Convex one piece. What I first noticed was how different it was to cut a baseplate without the pouch attached! It is something you definitely get use to, and it becomes easier. Attaching a pouch – I was warned – was tough to do if you hadn’t experienced it before. So I would click my pouch to the baseplate before hand a couple of times, so I knew how to apply it. The application of pressure to get the click into the flange – the stability ring – was the tough part and then it would click together and stay put for the whole day. I found my pouch would expand more and I would not feel it like I would do in a one piece. I also found changing the pouch each morning was helpful, it was like a fresh bag feeling but without a whole routine. I then also tried some of the Hollister pouches and found the plaster adhesive border to the baseplate very comfortable and easy to apply. However, the opening of the pouch was problematic at times, and the fabric on the actual pouch would wear badly, especially if I wanted to shower. The edge of the baseplate would lift too, meaning I would be changing this bag every evening. I didn’t fit my lifestyle. With both bags, I was able to wear my normal clothes; Hollister was less visible but Coloplast was just as noticeable as my one piece. Not that this mattered much, how it looked to others wasn’t my biggest concern. The functionality and its ability to last my usual two days was my priority. I’ve found that using a two piece helps when I am traveling and when I go away from home. I bring it along as an option, because I like the flexibility. And almost two years down the line, I am more comfortable and capable of changing between the two options. 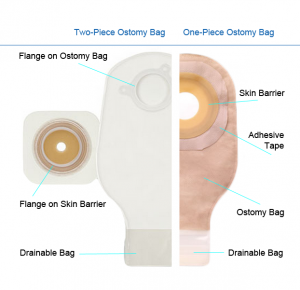 Which style of ostomy bag do you use? Does it change on circumstances? If yes, which situations call for which system?